Release Date: May 11th, 2007 (Regal E-Walk and AMC/Loew 34th St.) by CodeBlack Entertainment. The Cast: Vivica A. 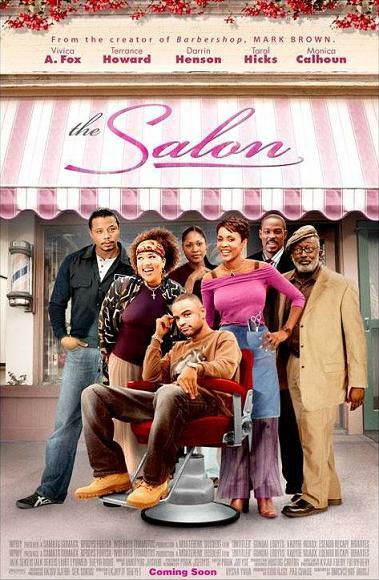 Fox, , Darrin Henson, Kym Whitley, Monica Calhoun, Taral Hicks, Dondre Whitfield, De'Angelo Wilson, Garrett Morris, Brooke Burns, Sheila Cutchlow, Terrence Howard. BASIC PREMISE: Jenny (Fox) tries to save her salon from being taken over by the Department of Water and Power due to eminent domain. Based on the play “Beauty Shop” by Shelley Garrett. ENTERTAINMENT VALUE: The Salon is on more on par with the silly, amateur film Hair Show rather than the hilarious and refreshing Barbershop. Vivica A. Fox plays Jenny, a single mother who deals with saving her salon and, in a contrived, unnecessary subplot, disciplining her misbehaving little son. Every character at the salon seems so unrealistic and over-the-top that they get annoying very fast, especially D.D. (Wilson), the flamboyant barber. The attempts to be funny using mostly offensive, racist humor fall flat. None of the actors or actress manages to stand out in any lively way—even Jenny comes across pretty dull. The subplot involving the lawyer (Henson) from the Department of Water and Power, who brings Jenny to court while flirting with her, could have been fleshed out much more. Even the court scenes aren’t remotely convincing. Writer/director Mark Brown simply fails to add anything imaginative, refreshing or, most importantly, entertaining. He sticks to a predictable formula full of clichés which don’t generate any real laughs or drama. This makes the film Beauty Shop look like a classic by comparison. No wonder it's been sitting on the shelf for nearly 3 years. INSULT TO YOUR INTELLIGENCE: Contrived, irritating and unimaginative. IN A NUTSHELL: A contrived, irritating, offensive and unimaginative bore.